Hello, and welcome to the Herping Michigan Blog! I'm Nick Scobel, a biologist and naturalist that has spent the past few years traveling the eastern United States working at various places. For as long as I can remember, I've been interested in nature and the environment. When I was young, my dad used to take me out hiking, fishing, and camping and it was through these experiences that I gained a love for the natural world. Many of my summer days as a kid were spent at a local creek where I would come with jars filled with frogs and garter snakes in hand. 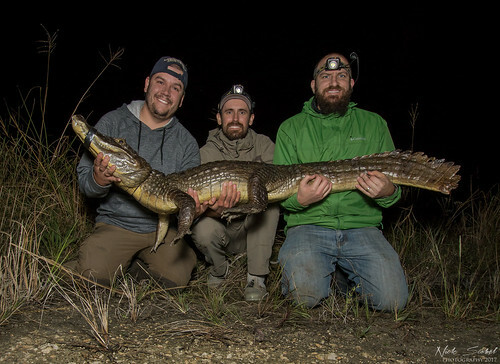 Biologists Ed Metzger, Mike Rochford, and I with a large Spectacled Caiman (Caiman crocodilus) we captured and removed from the edge of the Everglades in January of 2018. My research interests involve the ecology & evolution of reptiles & amphibians and ongoing conservation work involving these taxa, particularly pitvipers, salamanders, and turtles. In 2015, I spent my time working at the Joseph W. Jones Ecological Research Center at Ichauway in Gerogia. 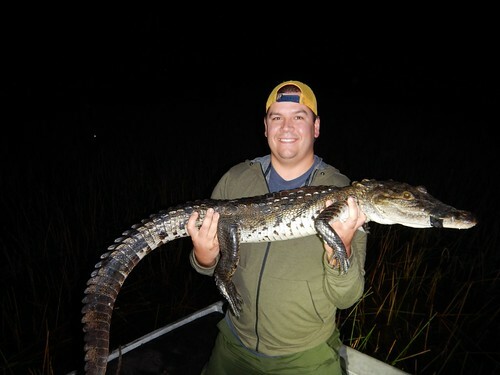 After that, I worked as a biologist for the University of Florida's Ft. Lauderdale Research & Education Center where I spent most of my time working on long term crocodilian monitoring and invasive species management. I have many fond stories and posts I'd like to make from my two years in Florida, I just need to find the time to get around to posting them. I recently moved back from south Florida to southeast Michigan, and will be working as a tech in the summer of 2018 on a massasauga rattlesnake project. Myself with a Morelet's Crocodile (Crocodylus moreletii) captured, measured, and release in Belize in December of 2017. In my spare time, I enjoy traveling around Michigan and other parts of the country to find and photograph reptiles & amphibians. So if you're out in a state park, state forest, or preserve in Michigan and happen to bump into me, don't hesitate to say hello. Happy herping everyone!